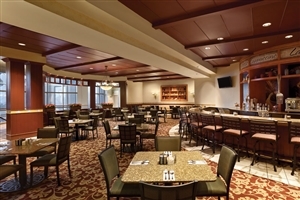 Travelbag offers a wide and varied selection of fantastic hotels in Atlantic City to meet all of your discernible needs. Whether you are travelling on a budget and require a cheap hotel, seeking something to accommodate the entire family in comfort, or treating yourself to a luxuriously appointed resort, Travelbag pledges to offer a Atlantic City hotel to suit everyone. With our excellent up-to-the-minute deals, superb quality line-up of hotels and resorts, and commitment for value-for-money, Travelbag is certain to have something to meet every budget, requirement and preference. Here is just a selection of our favourite and cheapest hotels in Atlantic City. Please use our search panel above to find your perfect choice. One of Atlantic City’s most famous and most popular hotels, the Harrah’s Resort & Casino is a recognised fixture of its distinctive skyline. A place of fun and excitement, Harrah’s Resort & Casino offers a wealth of excellent facilities and amenities, including chic bars, thrilling nightspots, swimming pools, a spa ... and, of course, a full-scale casino in which to try your luck. In addition, guests will appreciate comfortable and spacious accommodation with views across the city and the ocean, as well as a vast choice of superb dining options to suit every palate. Experience an icon of Atlantic City with a stay at the Bally’s Hotel & Casino, where the fun never ends. Located close to Atlantic City’s famous Boardwalk, Bally’s Hotel & Casino offers relaxing and luxurious hospitality in a setting overlooking both the city skyline and the Atlantic Ocean. 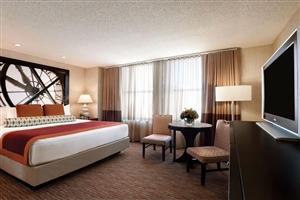 Facilities at ... Bally’s Hotel & Casino include a large and lavish Casino, a swimming pool, shops, a spa and a fitness centre, while guests can also take advantage of regular live entertainment and fun nightspots. Stay in the iconic Caesars Hotel & Casino when you book your Atlantic City holiday for the ultimate hospitality experience. 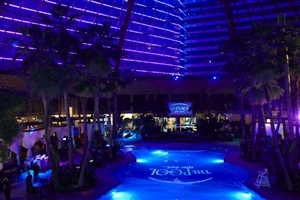 Enjoy Caesars renowned brand of luxury and opulence in a fabulous beachside and Boardwalk setting, whilst taking advantage of the superb facilities available, including its lavish Casino, the indulgent Qua ... Baths & Spa, the magnificent rooftop swimming pool and the chic Dusk Nightclub. Reside in comfortable and spacious guestrooms and suites during your stay, and choose from a huge variety of excellent restaurants and bars to suit every taste.